Nobody tries to make the coyotes act like beavers, or the eagles behave like robins. Christians see themselves as set apart from the rest of the animal and plant world by superiority, even as a special creation. Perhaps the principles of brotherhood which the world urgently needs come more easily to the Indian. Do you know that trees talk? Well, they do. They talk to each other, and they’ll talk to you, if you will listen. Trouble is, white people don’t listen. They never listened to the Indians, and so I don’t suppose they’ll listen to the other voices in nature. But I have learned a lot from trees, sometimes about the weather, sometimes about animals, sometimes about the Great Spirit. We were lawless people but we were on pretty good terms with the Great Spirit, creator and ruler of all. You whites assumed we were savages. You didn’t understand our prayers. You didn’t try to understand. When we sang or: praises to the sun or moon or wind, you said we were worshipping idols. Without understanding, you condemned us as lost souls just because our form of worship was different from yours. We saw the Great Spirit’s work in almost everything: sun, moon, trees, wind, and mountains. Sometimes we approached him through these things. Was that so bad? I think we have a true belief in the supreme being, a stronger faith than that of most of the whites who have called us pagans. The red savages have always lived closer to nature than have the white savages. Nature is the book of that great power which one man calls God and which we call the Great Spirit. But, what difference does a name make? We had none of your denominations to split us, it introduce hatreds in the name of religion. We had no man-made guides to ‘right living’; nature was our guide. Nature is still Bible, and I’ve just retruend after many days of studying it. I’ll tell you what I think. We were on better terms with the Great Spirit before the white man came than we were after he confused us by attempting to frighten its into joining his churches. As devil worshippers, they said we were heading right down the road to hell. Frighten us? Who wouldn’t be frightened if they were told they’d burn in a lake of fire forever if they didn’t accept certain teachings. The white man meant well. Many of the missionaries were my friends, but they underestimated the Indian faith when they used fear to make us change. There is no such thing as hell to our native religion, and we can never imagine the Great Spirit choosing to inflict everlasting torture on man as a punishment. As I understand nature’s ruler, he would not restrict the truth to a few favoured humans, allowing the others to remain in eternal darkness. If the Great Spirit is prepared to reveal secrets of importance to people, he will give all humans in all lands an equal chance of getting that enlightenment. My people have been searching for the truth for generations, and they continue to find it. All races of people have conducted such searches. Perhaps that explains why nearly all the world’s religions have points in common, like charity forgiveness, and belief in life after death. 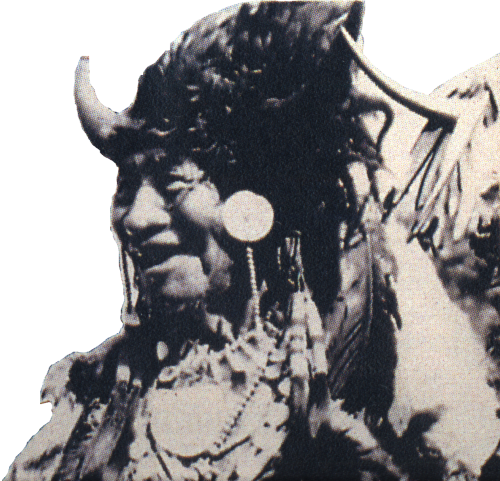 Crowfoot of the Blackfeet tribe was a thinker, as everyone agrees, but he never gave up his native religion. They coaxed him, but he held on to his own beliefs. The old chief didn’t ridicule your religion and its teachers, but his own faith brought him enough satisfaction and comfort. The same could be said about Piapot. For years he was under pressure to change. He didn’t try to convert white men to his religion, but he hated bigotry and he had no time for people who contended that the white man’s religion was inspired by the Creator but the Indian’s was not. Who do they suppose inspired the Indian’s religion?